It seems 20th anniversaries of albums are everywhere now. Off the top of my head, I know that Shelby Lynne, Wilco, and Todd Snider are all celebrating twenty years of something. Of course, some of that is because of the resurgence of vinyl, which makes it a win/win for both the artist and the consumer. I was curious about one of the albums I consider to be in the top ten of best albums ever written, and lo and behold, it was put out in 1994 – making this year the 20th anniversary. Ray Wylie Hubbard is a great songwriter. Undisputed. Most known for songs like “Snake Farm”, “Up Against the Wall Redneck Mother”, and “Screw You, We’re From Texas”. He is also known for his live shows that combine wit, rock ‘n roll, blues, country and humor, often self-deprecating. 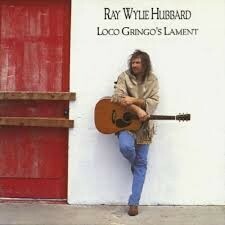 However, with the release of LOCO GRINGO’S LAMENT in 1994, he became much more than that. He became one of the smartest men and one of the best songwriters I’ve ever heard. Each song holds up on its own, but as an album, each song bleeds into the next, culminating with the last three songs that show more than any other, the songwriting genius Ray Wylie really is. Listen to it. I dare you. Listen to it and try not to feel, try not to think, try not to empathize. Twelve songs – all linked thematically by despair, tragedy, hope, redemption and love. “Love Never Dies” is a ballad and “Little Angel Comes A-Walkin’” is a blues number that picks up the tempo of the album a little bit. “After the Fall” is the classic redemption song. I don’t ever want to say autobiographical, however, his voice as the narrator oozes credibility. This song is not a story about hope, it is telling you that there is hope and he forces you to believe it. There is the same feeling throughout the album and especially on “I’ve seen that Old Highway”, “Bless the Hearts of the Lonely”, and “Didn’t Have a Prayer”. “Loco Gringo’s Lament” is about the tragic endings that occur in the music business, from Hank Williams to musicians just beginning to make a name for themselves. “The Real Trick” is by far my favorite song on the album. The lyrics are like a boxer pounding the body. Each one takes a little more breath away, each one does more than sting. Chris said if being a parent so tough how come just anybody can be one? I don’t concern myself with how Jesus was born or if he was raised from the dead. The album comes full circle and ends the way it began with “The Messenger.” Much is made about his use of a poem by Rainer Maria Rilke. But if you examine the real album cover and not the reissued one, I think the song is telling us who the real messenger is. He said “Our fears are like dragons guarding our most precious treasures? The real question is do we have the ears to truly hear the message? I just want to tell you that I’m new to blogging and certainly loved this blog. Most likely I’m want to bookmark your blog . You surely have fantastic writings. Regards for revealing your web-site. This is an excellent article and I am glad that I found your site. I have been looking for information on this topic for the last couple of days as well as was happily stunned to discover it on your site. I intend to be back over the next few months to see if you have any various other items of info that can assist me. What i do not realize is if truth be told how you are now not actually much more neatly-preferred than you may be right now. You are so intelligent. You recognize thus considerably in relation to this matter, produced me personally imagine it from a lot of various angles. Its like men and women aren’t involved until it is one thing to do with Girl gaga! Your own stuffs outstanding. All the time take care of it up! I will immediately seize your rss as I can’t find your e-mail subscription hyperlink or e-newsletter service. Do you have any? Please allow me recognize in order that I may subscribe. Thanks. Great site. Lots of useful information here. I¡¦m sending it to some friends ans also sharing in delicious. And of course, thanks in your effort!